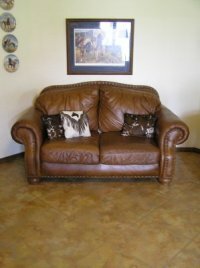 Painting concrete is becoming more and more popular and, therefore, I thought it maybe of interest to see what can be achieved with a great deal of patience and, in my opinion, a lot of talent. Margo Cuccio not only found out where the much sought after "Breakthrough" sealant* can be obtained both in America and the UK (details below) but also sent me instructions and pictures showing the results of her efforts. I am sure you will agree it is most impressive. Here is a photo of my work in progress: The floor was prepared per your instructions - I had to prepare the floor by filling some cracks. I used two products manufactured by DAP. They worked wonderfully. I painted a base coat over the Kilz* to match the grout in my fireplace. 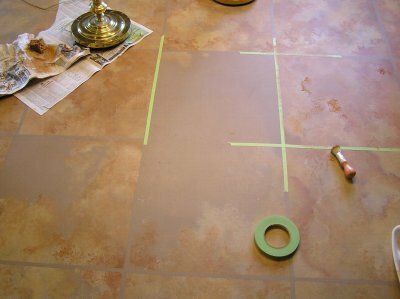 Floor was marked in pencil as if we were laying tile and grout lines were taped in before painting. Works best to peel off the tape as you complete a few squares. Next I'm using a sea sponge and a stipple brush to achieve the desired effect overlapping colors and in spaces letting the base color show through as long as it's not by a grout line. When people heard of my intentions to paint the floor they thought I was nuts. 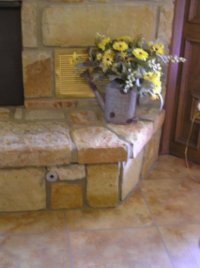 Painted it to look like tile to match the colors in my natural stone fireplace. My only complaints are that it's tedious and sitting on a floor painting as long as I have makes you hurt all over. I finally had a brainstorm and started using one of those little foam gardening pads that you use to kneel on. People can hardly believe their eyes. Everyone who has seen it now says it's beautiful! * Kilz is a primer and/or sealer. 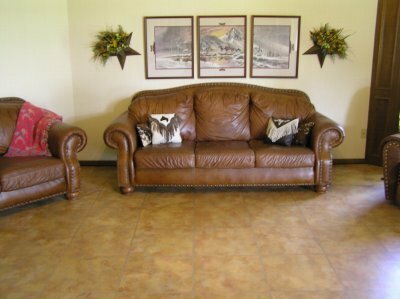 Breakthrough "clear satin" sealant is recommended to provide protection for your finished floor. * Apparently this product is very difficult, if not impossible to get hold of these days. One of the companies which used to supply it (HPI Finishing Supply) no longer seems to have a presence online. I researched the internet and called half a dozen paint stores. I found several companies that used to handle it but only one that has it now. Luckily I found out a pertinent piece of information. There is more than one product with a "Break-Through" name and the one you need for the floor application to protect and not damage all the work you've done to paint your floor is Break-Through "clear satin". A manager at a Sherman William's store in Tulsa, Oklahoma told me this; he was very familiar with the product but did not sell it. He said the sealer dries really harder polyurethane so I'm sure this is why it is recommended so highly. He also said that the sealer was manufactured by Vanex. They don't have a website. The are in Mount Vernon, Illinois, U.S.A.. PH. 618-244-1414. I told the lady how hard I'd worked to find the product and she informed me that they do not ever intend to have a website. I guess they don't care if they sell this product or not. She gave me a distributor in Tulsa, Oklahoma. They are Environmental Paint & Supply; there phone number is 918-437-3200. It's approx. $43/gal. Avenue Coatings in Colonbrook, Slough. Their phone number is 01753-686888 and online shop. As you will see I have now found some additional details regarding "Breakthrough" products but as there are apparently several different products with similar names I cannot guarantee that this is the same as that being recommended.